· Greatly convenient to hold your iPad 1,2,3 and 4 or other Samsung Tablets upto 10 inches at the headrest and facilitate the passengers to play at the back seat. 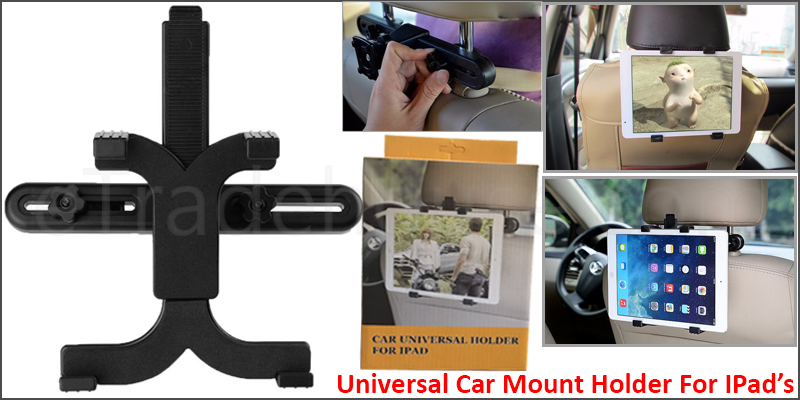 · Made of superior quality material, considerate design makes it can catch the headrest tightly while the car is moving. · Clip it on the back of car seat easily. · Telescopic structurefacilitates rapid disassembly and installation. · Allows the tablets to rotate at different angles, even 360 degree rotation so users can choose their favourite viewing angle by adjusting the holder. · It is a must item for tablets lovers. · Excellent design for the trend which most people are likely to use tablet PC anywhere. · Greatly convenient to hold the tablets at the headrest and facilitate the passengers to play at the back seat. · Loosen the back lever of the fixed seat, adjust height and depth, fasten lever.